be deluded in believing the most abominable lies against your innocence, and in joining in plots against your reverence, and being made the messenger of so many contaminated lies to my lord, the Bishop of Baltimore. I also feel sorry for breaking the laws of the Church by leaving you, my immediate pastor, to go to be married out of your parish. I do sincerely acknowledge the gratitude I received from Almighty God in opening my eyes and discovering the falsity of those infamous accusations alleged against your reverence. 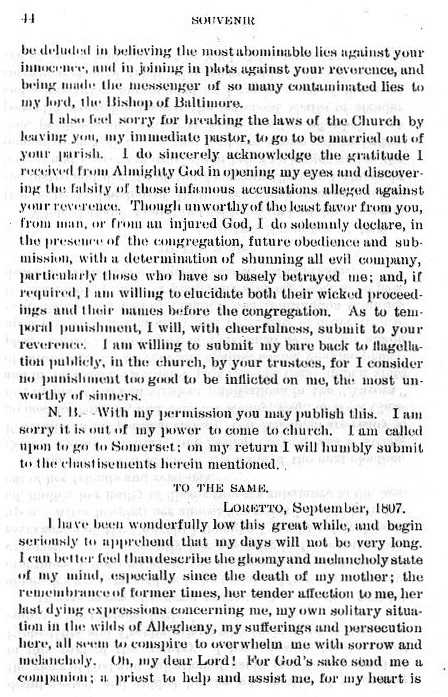 Though unworthy of the least favor from you, from man, or from an injured God, I do solemnly declare, in the presence of the congregation, future obedience and submission, with a determination of shunning all evil company, particularly those who have so basely betrayed me; and, if required, I'm willing to elucidate both their wicked proceedings and their names before the congregation. As to temporal punishment, I will, with cheerfulness, submit to your reverence. I am willing to submit my bare back to flagellation publicly, in the church, by your trustees, for I consider no punishment too good to be inflicted on me, the most unworthy of sinners. N.B. With my permission you may publish this. I am sorry it is out of my power to come to church. I am called upon to go to Somerset; on my return I will humbly submit to the chastisements herein mentioned.